Many news are coming about a lot of new tablet pc arriving to compete with iPad and even Apple would be bringing on a smaller version of the iPad but for most of tablet pc users only too factors are important ” is it easy to use and carry?” and “does the battery last long?” so all will depends on the display size, operating system, software, silicon muscle inside and the battery. “Using Apple products as reference I would put the iPad 9.7inch in the business tools range, iPhone 3.5inch and all the smart-phone in fun/mobile range who can do so much but that you can’t really use due to size of the screen and all the 7inch range new tablet pc in e-reader and gaming device range. This is based on input and portability criteria. To work seriously you need a minimum size for a usable virtual keyboard and finger pointing interaction, 9.7inch do it just fine. I used PDA back ten years ago and it never been for me more that a portable note, basic gaming and music player due to the size of the screen. Since I have my iPad I use my smartphone only to call, painfully slow typing chat on Skype, taking memo pictures and read ebooks, the screen is too small for my old eyes to do anything else for long. The gamer in me get rapidly get frustrated by fingers hiding all the action and that’s why I see 7 inch as a good size for easy to handle gaming device and to read ebooks or newspapers in the train (and maybe also to replace a car navigation system). Sadly at Ceatec 2010 I did not see any 7inch tablet powerful enough to be a good gaming device. We had laptop, heavy and power consuming, much more like a way to bring work back home than on the go. Came PDA and portability of office software but then battery life was lacking. Then came the net-book, lighter than laptop but also much less powerful, a solution for short business trip and linux users, and last spring came the iPad. This Tablet PC almost 10inch screen might look like a big fancy gadget but well complemented with apps and accessories it became the new best friend of some mobile business men. Just like the cybofax from Peter Hamilton’s books it just gives you all you need in a very simple device (except for voice operated control). Take an iPad, add to it a Dropbox, iWork, GoodReader and configure your email and calendar and here you are ready for work! If you don’t have 3G just get a mobile wireless router and now you can access your files, work and create and have fun anywhere! Soon are coming many new tablet PC but a 7ish inch display might not play the trick as it will not be small enough and yet not big enough. For my part I will stick to my iPad. This principle can be applied everyday of our life at home or in our work. We must always be aware of the effects of our actions to improve our life quality. Reduce means that we must be careful not to waste, use long lasting equipment and work at the origin of what create the pollution. Recycle means that we must give you preference to recyclable goods and do sorting and recycling in our trashes, avoiding valuable energy or material source to finish incinerated or buried. 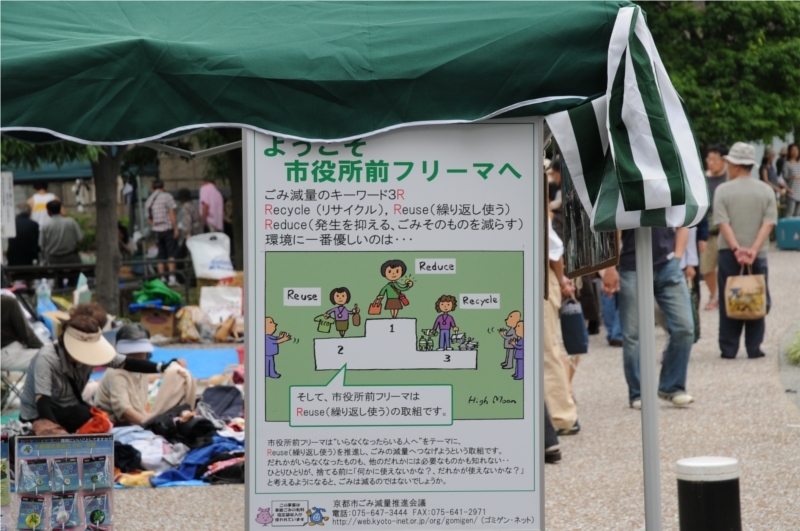 Re-Use means that before throwing away we must think about how to make the good usable again or using it for different purpose, or give to someone who will know how to re-use what we don’t need or want to use anymore. If you looked for a solar panel 20 years ago in every day’s life your only chance to find one was a big calculator or in the news on a satellite or a very remote place. Today you can still find those calculator but Photovoltaic energy is everywhere around (haven’t it always been anyway?). From wrist watch to lighting equipment in off grid area, on the roofs and walls of houses, offices and factories with constant esthetic improvement, in roads and natural parks infrastructures, solar power plants and of course still on satellite just to mention some of the current applications. Solar panel had evolved a lot since the first products. 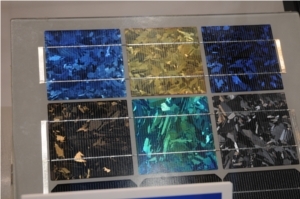 With different technologies like Mono or Poly Crystalline Silicon, Amorphous Silicon single and multi junction and other new Thin film technologies and CIGS. TMMS is in Japan, just next to Kyocera, Sharp and Sanyo and not far from Mitsubishi. Kansai area has a very high concentration of PV cell and module factories.Sharp PV Cells are manufactured in Nara, Kyocera in Shiga and Sanyo in Osaka and Mitsubishi in Iida, half way between Kyoto and Tokyo, with their PV Cell R&D in Hyogoken in Kansai area of course. In this country owning half of the Word’s market of photovoltaic cell and modules and at the edge of new technologies we study all the major actors’ moves and we can provide the most accurate view on the market and leaders’ technological roadmap to our customers to choose the good partner to supply them PV cell, PV modules and electronic peripherals like high efficiency and reliability inverters. Car is a part of our life style but it is also one of the tools of the global warming so let’s think about what can be done to help earth to cool down. You can avoid taking your car for short distance as your exhaust pipe catalyst filtering require a high enough temperature to filter efficiently and therefore you are polluting a lot during the warming. You can also try to use public transportation for more efficient use of fuel, just mind the pickpocket please. If you definitely need your car then adopt a calm driving and avoid pumping on your accelerator, change gear without going too high in rpm (if you are not yet on automatic like in Japan) and refrain from going at excessive speed. All this will reduce your gas emission and also help you to keep your gasoline and car maintenance budget lower. A car well maintained and tires at the right pressures will save you liters of carburant and improve the safety of people onboard. If you want to do more you can then decide to buy a car with Variable Cylinder Management like models from Honda able to use 3 of the 6 cylinders in certain conditions to reduce consumption or even those new clean Diesel engine cars from Toyota. If you are really convinced of the importance to fight Greenhouse Gas then you will buy a hybrid car, companies like Toyota and Honda are offering today a wide panel of model for hybrid car like Prius or Civic. The ultimate solution would be a fuel cell car but let’s keep that for the next article called Hybrid and Fuel Cell powered car. New fuel like Hydrogen, Methanol and other Bio-fuel are coming also to the front scene as well as fuel cell and solar panel adapted for car. Liquid Gas engine was a first and easy step to reduce pollution in center of cities but addressed more the smog than the real problem as this gas is also non renewable. LG engine taxi are already the standard everywhere in Japan for many years, easy when for taxi car there was until very recently only one model authorized for the all country, the Toyota Crown. This type of deal was made also between Shanghai government and Volkswagen, all Shanghai taxi where Santana VW with many LG engines. Citroen did it too in a city that I forgot in Chine like many others I am sure but recently, as all good things have an end, Chinese and Korean model are taking over the market at the remarkable exception in Shanghai of a new company using only Mercedes but definitely targeting a niche market and definitely not with clean engines yet. So, to conclude as you can see there is many ways to help to reduce our dependence on polluting fuel and if weather is nice and it’s not too far why not taking a walk or your bicycle next time and enjoy the fresh air? Today when you buy a car you can choose to protect the environment and choose a hybrid car. A hybrid car is a vehicle with a propulsion system resulting of the combination of 2 power types that compensate each other weakness. Most of today’s hybrid cars are based on electrical and combustion power combination like for example in the Toyota Prius with in addition smart systems to recuperate mechanical power from braking. Several methods are available for transfer of energy between the 2 sources and the car wheels and each manufacturer is working on mechanical and electronic solutions to optimize the system and provide to the driver the same or better comfort than a combustion engine. Coming next, but already here like the Honda FCX, fuel cell powered car will bring Greenhouse Effect Gas emission down but only if the hydrogen used is not coming or produced using fossil energy. Also those Fuel cell powered vehicles will use batteries or ultra capacitors or both to have a constant power output from the fuel cell transferred to the battery for charge and use later and ultra capacitors able to charge and discharge high power instantly. Wind turbine and Solar Photovoltaic Panel are the best candidates for catalyze process to produce cleanly Hydrogen. Company like BP solar already plan to have above each BP gasoline station to provide renewable hydrogen to it’s customers and Honda is supplying Hydrogen small scale facility to it’s customer buying a Fuel Cell car. Honda is even going further in their partnership selection as they offer global house energy solution, not only for the car. In Japan Company like Panahome are working on this kind of global concept. For some time now sugarcanes and other plants, easily transformable to ethanol or oil refined to biodiesel, are helping to reduce cars pollution to a degree under the name of bio fuels. This neutral carburant still require energy to be produced but refineries can use for example molasses generated by sugar production from sugarcane to power the plant. This is a very good example of renewable energy but if we look deeper in the biofuel production industry development a new danger is coming. Just like industrialized countries feed on low wages countries worker to keep cost down, biofuel industry is likely to focus on the same countries to setup plantation and refineries. Like the Chinese farmers who welcomed warmly big chemical plants in 2001 promising job for everybody and better life level many are seduced by the prospect and might regret after few years. This will have the effect to increase reforestation to clear the way to plantations and increase the price of what was once food commodities. For example the leader of sugar market, Brazil, convert an important part of its production to bioethanol and caused in the past years a strong price increase on sugar. Let’s take a look now at Malaysia. They let wood pulp companies destroy their ecosystem and create enormous acacias forest without animal life due to absent biodiversity. Malaysia is also leaders on palm oil production that claim more space on natural forest and accentuate current damage to the ecosystem. This problem is also impacting rich countries as in Europe where wine and oil producers might be tempted to sale more to distilleries than consumers due to price advantage. The same apply to USA corn that could soon become too pricey to finish on your plate but maybe this will avoid you ingesting GMO. The problem is that this frenzy on biofuel is very little for ecology sake but mainly a financial speculation. As Lester Brown from Earthpolicy.org explain much better than I this will bring only famine and not even enough to fuel 16% of the cars needs if technology does not improve. Countries with excess of those goods should be the only one to focus on it under strong regulation to avoid speculation on food commodities and keep security stock. Now some good news, Honda and Rite in Japan developed a new enzyme and process to produce bioethanol from leaves, wood and other biomass usually not efficient in fermentation process.Efforts in this direction will allow transforming waste in efficient biofuel without impacting our diet. Yes, I am proud to say that I was seating in the latest model of Toyota Prius Hybrid car in front of my home. At first I could not take of my eyes from the display showing in real time the propulsion system switching and recharging on the battery. Regretfully this was not my car but thanks to my father in law who had the patience to wait 3 months to get this great car, here in Japan. On a private note, I use my bicycle to commute everyday, rain or snow but it’s not too hard when you work 10 minutes from home. Anyway, that was a great experience to see in everyday’s life that without compromising anything the car lovers can experience green driving. Design, comfort and driving performance have nothing to envy to other cars of this type on regular propulsion and the silence is enjoyable when the electric engine only works. I was able to see in Yokohama EVS 22 show many marvelous achievements but having this car in everyday’s life context really brings a meaning to all the working efforts we are devoting to renewable energy and sustainable development. With current global temperature increase everybody tries to cool down in summer in counties that never needed that in the past. Not addressing properly this problem will bring enormous waste of energy. Anybody who visited a natural cave must have heard about the fact that going down 5 meters deep under the surface the average temperature is 15 Celsius degrees whatever the season is. Companies in Japan developed very efficient means using this natural temperature regulation to cool in summer and warm in winter. Several schools and university are using this technology today to maintain the comfort of their students without ruining the environment they will evolve in. Those solutions can be applied best to passive houses that make use of new materials to avoid the thermal exchanges or in good old stone houses that would have been upgraded with new passive style windows and under roof. A compromise between clean and non-clean energies comes with active heat pump systems that bring your hot water tank to 60 Celsius degrees by extracting external air heat even at -5 Celsius degrees but consume electricity but stays much more efficient than pure electrical heating. With air-conditioning machines flourishing a good combination seems evident putting together the cooling of your house with the warming of your hot water.